Psychologist Erik Erikson developed his eight stages of development to explain how people mature. The stages clarify the developmental challenges faced at various points in life. His theory is widely taught in developmental psychology courses in the United States. Stage-based theories of development were popular during Erikson’s era. Yet there is one important difference between Erikson’s theory and other popular models of his time. In Erikson’s theory, a person does not have to successfully complete one stage of development to move on to the next stage. Each stage has a conflict between two opposing concepts. For instance, the infancy stage’s main conflict is trust vs. mistrust. Although people of all ages may experience issues with trust, the infancy stage is where the challenge is most potent. What If the person does not overcome the challenges of a particular stage? The person will still progress to the next challenge. Yet the themes from the previous challenge may affect later stages. For example, a child who never establishes trust in infancy may grow into an adult who struggles with trust in romantic relationships. Infants depend on caregivers, usually parents, for basic needs such as food. Infants learn to trust others based upon how well caregivers meet their needs. Trust: When caregivers respond promptly to an infant’s cries, the baby can learn to rely on others. As caregivers fill an infant’s needs, the baby can develop a sense of trust and security. Mistrust: If caregivers neglect an infants’ needs, or if care is sporadic, an infant may grow insecure. They may learn they cannot rely on others and thus feel unsafe. 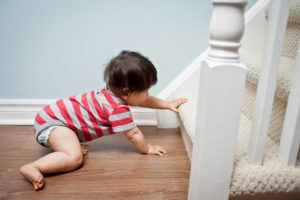 During this phase, young children begin exploring the world around them. They learn more about their environment and their place within it. They also develop basic skills such as toilet training. Autonomy: In this stage, caregivers often serve as a safe base from which to explore the world. When caregivers encourage independence, children will feel secure enough to take risks. Shame: Children whose caregivers discourage them may develop feelings of shame. If caregivers foster excessive dependence, the child may learn to doubt their own abilities. Preschoolers are increasingly focused on doing things themselves and establishing their own goals. Initiative: When caregivers nurture these tendencies, children learn how to make decisions and plan for the future. They can grow into adults who are able to follow their ambitions. Guilt: If children are criticized for being assertive, they may feel guilt for pursuing their desires. Controlling caregivers may teach children to follow another’s lead rather than starting their own plans. As children grow in independence, they become increasingly aware of themselves as individuals. They begin to compare themselves with others. Industry: Children who are accomplished compared to their peers can develop self-confidence and pride. Praise for their achievements can boost their self-esteem. Inferiority: Children who do not achieve certain milestones may doubt their abilities or self-worth. When children are constantly criticized, they may develop feelings of inferiority. The famed term “identity crisis” comes from this period of development. During this stage, adolescents’ main goal is to answer the question “Who am I?” They may try different personas to determine which roles fit them best. Identity: To succeed in this stage, adolescents need to establish a coherent sense of self. They will need to determine their priorities in life (family, academic success, etc.). Then they will need to set goals for their adult selves based on those values. Role confusion: Some adolescents may have a weak sense of self. They may struggle to break away from the person their parents or peers expect them to be. Without a consistent identity, they may grow confused about what they truly want for the future. According to Erikson, young adulthood is the period during which many people get married or develop significant relationships. It has been defined as anywhere from 20-24 years to 20-40 years. Intimacy: Relationships can be a key source of affection and intimacy in adulthood. Many find emotional benefits from having a committed, lifelong bond. Isolation: According to Erikson, people who do not develop relationships may become socially isolated. They may develop long-term feelings of loneliness. The focus of this stage is to contribute to society and the next generation. Adults in this stage are often at the height of their careers. Many people are raising children. Generativity: People may offer guidance to the next generation through parenting or mentorship. They may also offer lead the way by leaving a legacy. Contributing to society’s future can give people a sense of community and purpose. Stagnation: Some people may feel as if they have no impact on society. If people do not find their work meaningful, they may feel restless or isolated. Some may feel they have “peaked” and that their lives will only get worse in the future. During this phase, older adults reflect on the life they have lived. Ego Integrity: Those who feel fulfilled by their lives can face death and aging proudly. Despair: People who have disappointments or regrets may fall into despair. Erikson’s eight stages of development is a popular theory. Yet it has also received a fair amount of criticism from the psychological community. Erikson is often criticized for supporting a limited view of human development. Critics argue Erikson focused too much on childhood, neglecting the development that occurs in adulthood. He admitted a person’s identity could change in adulthood after the adolescent stage. Yet he did not offer any speculation on how or why such a change would happen. Other critics take issue with his views on gender. Erikson agreed with Freud that personality differences between genders are rooted in biology. He claimed human development also differed by gender. Feminist theorists criticize Erikson for using the male experience as the default template for human development. Lastly, some critics say Erikson focuses too much on speculation rather than data. Erikson based much of his theory of biographical case studies. Seeing the stages play out in a case study can help people understand the concepts at work. Yet the details of Mahatma Gandhi’s development are difficult to apply on a broad scale. very good meme! made learning a breeze. This is great and all, but how can anyone expect to trust it if there is no author. Hi Tony! Thank you for reading and sharing. At the bottom of the pages, we include APA citations of the references. Thanks again for reading! Hi Jess; thanks for your question. Please know GoodTherapy.org isn’t intended to be a substitute for professional advice. A trained mental health professional can help with this question or any challenges you may be facing. If you’re looking for a counselor near you, you can search GoodTherapy.org’s therapist directory here: https://www.goodtherapy.org/find-therapist.html.